The Warburg Effect describes a phenomenon in which cancer cells voraciously consume glucose for energy—something scientists have long known, yet have had little success exploiting as a way to stunt tumor growth. Now researchers at Duke Cancer Institute have not only untangled an unusual wiring system that cancer cells use for carbohydrate metabolism, but also identified a natural compound that appears to selectively shut down this system in laboratory studies. "The Warburg Effect has been known for decades, but the underlying mechanisms are not well understood," said Jason Locasale, assistant professor in the Department of Pharmacology & Cancer Biology at Duke and senior author of a study published Sept. 14 in the journal Cell Metabolism. "We started with the idea that if you understand how it works, you should be better able to control it, and we think we might have some insight on that, as well." 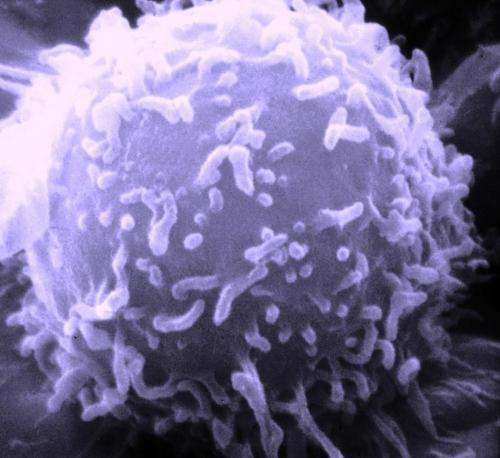 Locasale and colleagues, including lead author Maria Liberti, studied cancer cells to determine how their metabolism changes so dramatically from that of normal cells, which use oxygen to break down sugar. Cancer cells, instead, use fermentation, which is less efficient and therefore uses more sugar. The researchers found particular points where carbohydrate metabolism is controlled differently in cancer cells undergoing the Warburg Effect, and they homed in on an enzyme, identified as GAPDH, that controls the rate at which glucose is processed in cancer cells. And while the Warburg Effect is strong in many cancers, it's absent or weaker in others. By measuring the GAPDH enzyme, the Duke team was able to develop a predictive model to measure how extensively cancer cells are under the influence of the Warburg Effect. Where the effect is strongest, the tumors could potentially be vulnerable to a therapy that targets the process. "We've seen with genetics that cancers can be targeted based on whether certain mutations are present, and it could be that selectively targeting tumors based on their metabolism could have a similar impact," Liberti said. Armed with their findings, the researchers then scoured the literature to see if there were any known compounds that might block the GAPDH enzyme. One molecule called koningic acid, or KA, seemed to have potential. It was discovered 30 years as part of a search to find drugs that lower cholesterol. That quest led to statins, and KA was abandoned. The molecule is produced by a sugar-eating fungus that colonizes sugar-rich environments such as sweet potatoes. The fungus generates KA to ward off bacteria that might try stealing its sugar source. Suspecting that KA might be a natural molecule that targets organisms or systems involved in accelerated glucose metabolism, the researchers tested the molecule in cancer cells and mouse models. They found that KA does, indeed, selectively inhibit the GAPDH enzyme, curbing the ravenous glucose consumption in tumors undergoing the Warburg Effect and leaving normal cells alone. Locasale said their findings warrant further study, notably to determine whether KA's effects can be reproduced in additional animal and cell studies and whether other drug-like molecules might work along the same energy pathway. "These findings not only show that KA's efficacy is linked to the quantitative extent of the Warburg Effect, but that this also provides a therapeutic window," Locasale said. "This could provide another way to attack cancer beyond the genetic makeup of the tumor. That's encouraging."